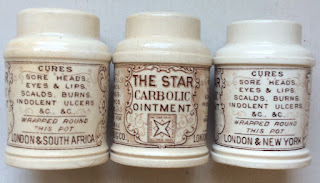 This page shows the 'Star Carbolic Ointment pots' - that originate most probably from Maryland in the United States. 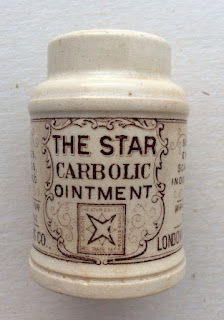 In the United States a number of pharmacies were found to be listed with the name Star Drug Company so it is quite likely this ointment pot originated from across the Atlantic. The products would therefore have been and distributed in the US, and internationally in the UK and South Africa. 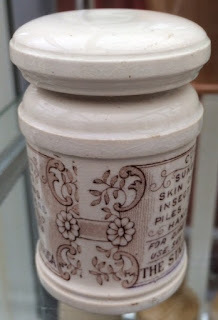 The pots bear a sepia print with printing all around the pot stating the cures and carry a large ceramic cap. 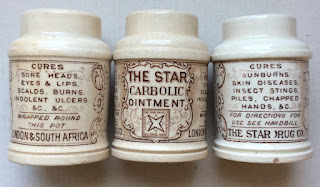 Two variations exist for these pots, firstly one showing the London & New York address and the other the London & South Africa address. 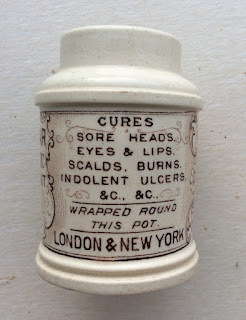 No prices are listed on either pot. 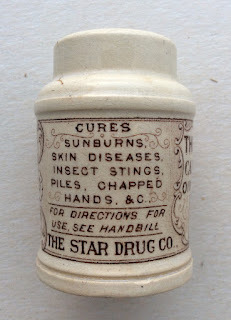 Both variations of these pots are scarce, particularly in good condition. 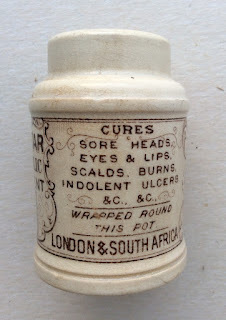 A small article appears in the ABC magazine number 16 concerning the London & South Africa ointment pot.